A recently completed survey--don't ask who took it--showed that 99.99 percent of all Americans suffer from "dento-phobia"--fear of going to the dentist. These people break out in a sweat when the thought of dentistry crosses their minds. But there comes a time when even the most cowardly must submit to being laid out--another suggestion of the funeral--on that instrument of torture euphemistically called the dentist's chair. Before making an appointment, however, the more extreme dental cowards want to know just how bad their teeth have to be before they absolutely have to go to the dentist. You Know It's Time To Go To The Dentist When... "you can use toothpicks sideways to clean between your teeth." 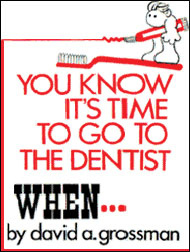 This is just one of the indications noted in this hilarious collection of dental wit by David A. Grossman, himself a practicing dentist. Like many dentists, Dr. Grossman just loves his work. Not content to tell you when it's time to visit the dentist's office, he goes on to say how you'll know you've actually arrived there. Dr. Grossman also tell you when treatment is finished ("You feel like you just auditioned for the part of an automobile-crash dummy"), gives you ten reasons for going to the dentist ("No 5. It's better than visiting the proctologist"), and concludes with a glossary of dental terms. All in all, this is a book that is sure to bring tears to your eyes--whether from laughter or the thought of going to the dentist depends on your degree of dento-phobia.